The instant Lady Diana Westover spies Edmond Terrington, Viscount Adderly, across a crowded room, the lovely, sheltered miss believes she's found the man she's been searching for. Though she knows nothing of men, Diana longs to pen a romantic novel. So she resolves to study the darkly handsome, scandalously seductive lord's every move, to experience the pleasures of his soft kisses and sensuous caresses...all in the name of research. Who is this infuriating female who is everywhere he turns? Edmond is used to fawning admirers, but this attractive chit seems interested in something other than passion. And the more immune she remains to Edmond's charms, the more enchanted he is by hers. Well, this calls for a serious seduction, for he will be bested by no woman, no matter how bright, witty and delightful! But once he sets Diana's desires gloriously free, how will Edmond contain the yearnings of his own traitorous heart? This Regency series has a rather different history. The first two books, KISS ME QUICK and KISS ME AGAIN, were written for Avon Books. The final two, A LOVER'S KISS and THE VISCOUNT'S KISS were written for Harlequin. All are available in ebook format and all were written to "stand alone" so you won't feel lost if you haven't read the other books in the series. 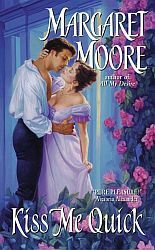 "KISS ME QUICK is a delightful Regency reading experience that will have you turning the pages to arrive at the end of both KISS ME QUICK and the novel within a novel, Lady Diana's Castle of Count Korlovsky."